Mirroring—mimicking other people’s movements, expressions and word choices—is so common that we tend to do it without noticing. However, it has a surprisingly large effect on how we perceive the person who mirrors our own behaviour. Among the first researchers to study this systematically were Tanya Chartrand and John Bargh, who did a set of experiments published in 1999. 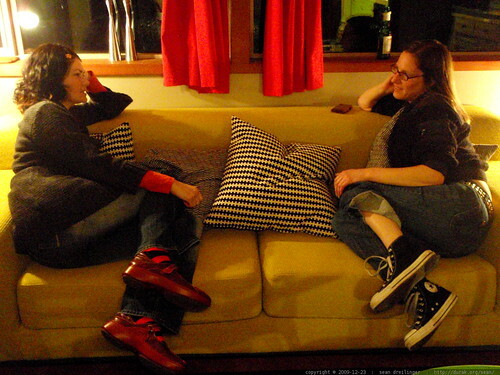 They looked at whether mimicry happens automatically by having each study participant carry out a shared task with another participant (who was actually an associate of the researchers). The associate had been instructed to vary his or her mannerisms in specific ways, such as by smiling, rubbing his or her face, or shaking one foot. Videos of the real participants showed that they did each of these behaviours more often when the associate was doing it—even though the associate was a stranger and even though the participants didn’t notice the associate’s mannerisms. A second experiment was done the same way except that the associates either deliberately mirrored the mannerisms of the study participants or displayed only neutral mannerisms. Responses to a questionnaire afterward showed that the study participants who had been mimicked liked the associate more and thought the interaction had gone more smoothly—even though none of them had noticed the mirroring. It appears to work outside the research laboratory, too. A team of Dutch researchers asked a waitress in a small restaurant to help them with a real-world study. With half her customers, she repeated each order after it was given; with the other half, she didn’t repeat the order but made clear she had heard and understood it. The average tip was 69% higher among those customers whose orders were repeated. Another Dutch study found that study participants whose behaviour had been mirrored were more likely to help the person who had mimicked them and more likely to both help other people and donate to charity after being mimicked. Another study found that study participants who were mirrored during an interview shifted their attitudes about a sport toward those of the person mirroring them. A speed-dating study found that women who mirrored the words and body language of the men they were talking to were perceived as more sexually attractive by those men. So, if you mirror someone’s behaviour, they will like you more, give you bigger tips, help you more often, shift their attitudes to match yours, and find you more sexually attractive. Sounds like a magic potion, doesn’t it? Of course, it’s not that simple. Still, if you’re going to be asking people for something—donations, volunteers, memberships—it might help to pay attention to their words and their body language and mirror what you can. Paying attention is seldom a bad thing, and the people who unconsciously mimic most are the ones who consciously try to understand their conversation partner’s perspective. Upon reflection, I’m all for it. Subscribe to comments with RSS or TrackBack to 'Mirror, mirror…'.